The identity of this gold nugget has been lost to time. This is a plaster cast of a gold nugget which is housed in the Mineral Section of the Carnegie Museum of Natural History. 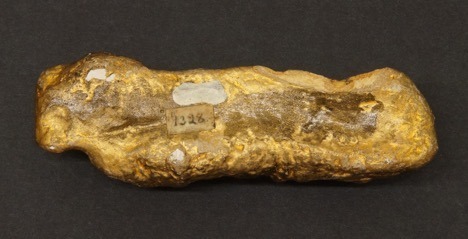 It is believed to be one of six casts of famous gold nuggets acquired by the museum from Ward’s Natural Science Establishment in 1897. This specimen (CM33100) measures 12.8 x 3.9 x 2.9 cm (Photos by Deb Wilson). of them at the Chicago World’s Fair in 1893.
original 100 lbs. Wards #1214, CM16711. November, 1872; Weight of original 155 oz. 24, 1880. Weight of original 80 oz., Wards #1467, CM33102. Debra Wilson, Section of Minerals, wilsond@carnegiemnh.org . Debra Wilson is collections assistant in the Section of Minerals at Carnegie Museum of Natural History. Museum employees are encouraged to blog about their unique experiences of working at the museum.